"St. Jude" redirects here. For other uses, see St. Jude (disambiguation). For Thaddeus of Edessa also known as Adai Mar Addai, see Thaddeus of Edessa. Jude, also known as Judas Thaddaeus (Greek: Θαδδαῖος; Coptic: ⲑⲁⲇⲇⲉⲟⲥ; Syriac/Aramaic: ܝܗܘܕܐ ܫܠܝܚܐ), was one of the Twelve Apostles of Jesus. He is generally identified with Thaddeus, and is also variously called Jude of James, Jude Thaddaeus, Judas Thaddaeus or Lebbaeus. He is sometimes identified with Jude, the brother of Jesus, but is clearly distinguished from Judas Iscariot, the apostle who betrayed Jesus prior to his crucifixion. Catholic writer Michal Hunt suggests that Judas Thaddaeus became known as Jude after early translators of the New Testament from Greek into English sought to distinguish him from Judas Iscariot and subsequently abbreviated his forename. Most versions of the New Testament in languages other than English and French refer to Judas and Jude by the same name. Saint Jude's attribute is a club. He is also often shown in icons with a flame around his head. This represents his presence at Pentecost, when he received the Holy Spirit with the other apostles. Another common attribute is Jude holding an image of Jesus Christ, known as the Image of Edessa. In some instances, he may be shown with a scroll or a book (the Epistle of Jude) or holding a carpenter's rule. Jude is clearly distinguished from Judas Iscariot, another apostle and later the betrayer of Jesus. Both Jude and Judas are translations of the name Ὶούδας in the Koine Greek language original text of the New Testament, which in turn is a Greek variant of Judah (Y'hudah), a name which was common among Jews at the time. In most Bibles in languages other than English and French, Jude and Judas are referred to by the same name. The first two are almost always thought to be the same person, although theologian Raymond Brown saw the identification as uncertain. The latter two are also usually thought to be the same person, though this too is not certain; see Epistle of Jude. Catholic tradition generally holds all of these four to be the same person; while Protestants generally believe 1&2 to be one person, and 3&4 to be a one person, but different from 1&2. Translations into English from the original Greek of the New Testament vary in their rendering of Luke 6:16 and Acts 1:13. A literal translation of the references to Jude in these passages gives "Jude of James", as in Young's Literal Translation of the Bible, but scholars differ on whether this means "Jude, brother of James" or "Jude, son of James". The King James and the Douay-Rheims versions call him "Judas the brother of James", making him the same person as the writer of the Epistle of Jude, who identifies himself as "Jude, the servant of Jesus Christ, and brother of James" (Jude 1:1). Most modern translations (including the New International Version, Revised Standard Version and New Revised Standard Version), identify him as "Jude the son of James", and not the same person as the author of the Epistle of Jude. Protestant scholar Darrell L. Bock writes that it must mean "son" not "brother", because when "brother" is intended, the Greek word for "brother" (adelphos) is present. Bock also says that means he was not the brother of Jesus. Opinion is divided on whether Jude the apostle was also Jude, brother of Jesus, the traditional author of the Epistle of Jude. Generally, Catholics believe the two Judes are the same person, while Protestants generally do not. In the apostolic lists at Matthew 10:3 and Mark 3:18, Jude is omitted, but there is a Thaddeus (or in some manuscripts of Matthew 10:3, "Lebbaeus who was surnamed Thaddaeus", and therefore in the King James Version) listed in his place. This has led many Christians since early times to harmonize the lists by positing a "Jude Thaddeus", known by either name. This is made plausible by the fact that "Thaddeus" seems to be a nickname (see Thaddeus) and that many New Testament figures have multiple names (such as Simon Peter and Joseph Barnabas). A further reason is the fact that the name "Judas" was tarnished by Judas Iscariot. It has been argued that for this reason it is unsurprising that Mark and Matthew refer to him by an alternate name. Some Biblical scholars reject this theory, however, holding that Jude and Thaddeus did not represent the same person. They have proposed alternative theories to explain the discrepancy: an unrecorded replacement of one for the other during the ministry of Jesus because of apostasy or death; the possibility that "twelve" was a symbolic number and an estimation; or simply that the names were not recorded perfectly by the early church. Thaddeus, one of the twelve apostles, is often indistinguishable from Thaddeus of Edessa, one of the Seventy Disciples. In some Latin manuscripts of Matthew 10:3, Thaddeus is called Judas the Zealot. This Judas was called by many names. He was said Judas James, for he was brother to James the Less, and he was called Thaddeus, which is as much to say as taking a prince; or Thadee is said of Thadea, that is a vesture, and of Deus, that is God, for he was vesture royal of God by ornament of virtues, by which he took Christ the prince. He is said also in the History Ecclesiastic, Lebbæus, which is as much to say as heart, or worshipper of heart. Or he is said Lebbæus of lebes, that is a vessel of heart by great hardiness, or a worshipper of heart by purity, a vessel by plenitude of grace, for he deserved to be a vessel of virtues and a caldron of grace. The same work writes that "Simon Cananean and Judas Thaddeus were brethren of James the Less and sons of Mary Cleophas, which was married to Alpheus." In all probability he spoke both Greek and Aramaic, like almost all of his contemporaries in that area, and was a farmer by trade. According to the legend, St. Jude son of Clopas and Mary of Clopas, sister of Virgin Mary. Tradition has it that Jude's father, Clopas, was martyred because of his forthright and outspoken devotion to the risen Christ. Although Saint Gregory the Illuminator is credited as the "Apostle to the Armenians", when he baptized King Tiridates III of Armenia in 301, converting the Armenians, the Apostles Jude and Bartholomew are traditionally believed to have been the first to bring Christianity to Armenia, and are therefore venerated as the patron saints of the Armenian Apostolic Church. Linked to this tradition is the Saint Thaddeus Monastery (now in northern Iran) and Saint Bartholomew Monastery (now in southeastern Turkey) which were both constructed in what was then Armenia. Sometime after his death, Saint Jude's body was brought from Beirut to Rome and placed in a crypt in St. Peter's Basilica which was visited by many devotees. Now his bones are in the left transept of St. Peter's Basilica under the main altar of St. Joseph in one tomb with the remains of the apostle Simon the Zealot. According to another popular tradition, the remains of St. Jude were preserved in an Armenian monastery on an island in the northern part of Issyk-Kul Lake in Kyrgyzstan at least until the mid-15th century. Later legends either deny that the remains are preserved there or claim that they were moved to a yet more desolate stronghold in the Pamir Mountains. Church of Saints Simon and Jude Thaddeus in Rudno, Poland. 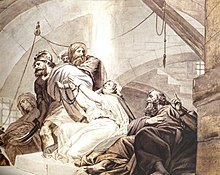 Jude is traditionally depicted carrying the image of Jesus in his hand or close to his chest, betokening the legend of the Image of Edessa, recorded in apocryphal correspondence between Jesus and Abgar which is reproduced in Eusebius' History Ecclesiastica, I, xiii. Eusebius relates that King Abgar of Edessa (now Şanlıurfa in southeast Turkey) sent a letter to Jesus seeking a cure for an illness afflicting him. With the letter he sent his envoy Hannan, the keeper of the archives, offering his own home city to Jesus as a safe dwelling place. The envoy painted a likeness of Jesus with choice paints (or alternatively, impressed with Abgar's faith, Jesus pressed his face into a cloth and gave it to Hannan) to take to Abgar with his answer. Upon seeing Jesus' image, the king placed it with great honor in one of his palatial houses. After Christ's execution, Jude Thomas the Apostle sent Addai, one of the 70 or 72 in Luke 10:1–12 to King Abgar and the king was cured. Astonished, he converted to Christianity, along with many of the people under his rule. Additionally, St. Jude is often depicted with a flame above his head, representing his presence at Pentecost, when he was said to have received the Holy Spirit with the other apostles. 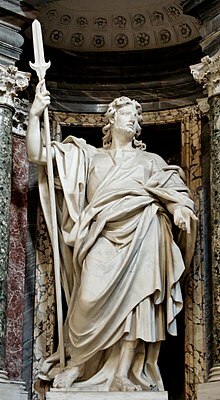 Statue of St. Jude in the Archbasilica of St. John Lateran by Lorenzo Ottoni. According to tradition, after his martyrdom, pilgrims came to his grave to pray and many of them experienced the powerful intercessions of St. Jude. Thus the title, 'The Saint for the Hopeless and the Despaired'. St. Bridget of Sweden and St. Bernard had visions from God asking each to accept St. Jude as 'The Patron Saint of the Impossible'. His feast day is 28 October (Roman Catholic Church, the Anglican Communion and Lutheran Church) and 19 June (Eastern Orthodox Church). The Order of Preachers (better known as the Dominicans) began working in present-day Armenia soon after their founding in 1216. At that time, there was already a substantial devotion to Saint Jude by both Catholic and Orthodox Christians in the area. This lasted until persecution drove Christians from the area in the 18th century. Devotion to Saint Jude began again in earnest in the 19th century, starting in Italy and Spain, spreading to South America, and finally to the United States (starting in the vicinity of Chicago) owing to the influence of the Claretians and the Dominicans in the 1920s. Among some Roman Catholics, Saint Jude is venerated as the "patron saint of lost causes". This practice stems from the belief that few Christians invoked him for misplaced fear of praying to Christ's betrayer, Judas Iscariot, because of their similar names. The ignored Jude thus supposedly became quite eager to assist anyone who sought his help, to the point of interceding in the most dire of circumstances. The Church also wanted to encourage veneration of this "forgotten" apostle, and maintained that Saint Jude would intercede in any lost cause to prove his sanctity and zeal for Christ. Many countries venerate the Apostle Jude and have constructed shrines or churches dedicated to his memory. Such sites include those in Australia, Brazil, Sri Lanka, Cuba, India, Iran, the Philippines, New Zealand, the United Kingdom, the United States and Lebanon. The National Shrine of St. Jude in Chicago, Illinois was founded in 1929 by the Claretian Missionaries. The Nationwide Center of St. Jude Devotions  in Baltimore was founded in 1917 by the Pallottines. The National Shrine of Saint Jude Thaddeus in the Philippines was erected by the Archdiocese of Manila in 1954 as Espíritu Santo Chinese Parish. The Shrine holds the saint's novena liturgy every Thursday, and is now under the Society of the Divine Word that also runs the attached Saint Jude Catholic School. The National Shrine of Saint Jude at Faversham in England was founded in 1955. Wikimedia Commons has media related to Jude the Apostle. ^ However, Philostorgius, the 5th-century Arian Christian historian, says in his Historia Ecclesiastica: "The district of Paneas was formerly called Dan. But in the course of time it came to be called Caesarea Philippi, and later still, when the heathen erected in it a statue of the God Pan, its name was changed to Paneas." ^ Butler, Alban. "St Jude, Apostle". EWTN. Retrieved 27 May 2014. ^ Lanzi, Fernando; Lanzi, Gioia (2004). Saints and Their Symbols: Recognizing Saints in Art and in Popular Images. Liturgical Press. p. 70. ISBN 9780814629703. ^ "St. Jude Shrine, Yoodhapuram". Yoodhapuramchurch.com. Retrieved 16 December 2013. ^ "Saint Judas". Encyclopædia Britannica. Retrieved 19 October 2015. ^ "The Letter of Saint Jude". Agape Bible Study. Archived from the original on 15 October 2015. Retrieved 19 October 2015. ^ "Frequently Asked Questions Regarding Saint Jude". Catholic Doors. Retrieved 19 October 2015. ^ Fournier, Catherine (2010). "Saint Simon and Saint Jude". Domestic Church Communications Ltd.
^ Brown, Raymond E., The Gospel According to Saint John volume 2, p. 641. ^ Neyrey, Jerome H., 2 Peter, Jude, Anchor Bible Reference Library, Doubleday, 1993. p.44-45. ^ "CATHOLIC ENCYCLOPEDIA: The Brethren of the Lord". ^ For instance Otto Harpan, in "The Apostle" (Sands, 1962), quoted at "St. Jude". 12apostlesofthecatholicchurch.com. Archived from the original on 26 January 2005. ^ Pesch, Rudolf. "Simon-Petrus. Geschichte und geschichtliche Bedeutung der ersten Juengers Jesu Christ", Paepste und Papsttum 15, Hiersmann, 1980. p.36. ^ Emanuela Marinelli (2014). "Judas, Thaddeus, Addai: possible connections with the vicissitudes of the Edessan and Constantinopolitan Mandylion and any research perspectives | Mimmo Repice and Emanuela Marinelli". Workshop on Advances in the Turin Shroud Investigation (ATSI). Academia.edu. Retrieved 2 May 2015. 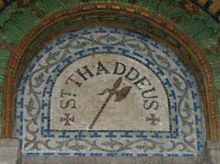 ^ "About Saint Jude, Shrine of St. Jude Thaddeus, San Francisco, Ca". Stjude-shrine.org. Retrieved 16 December 2013. ^ "CATHOLIC ENCYCLOPEDIA: Doctrine of Addai". newadvent.org. Retrieved 27 October 2016. ^ "Lk 10:1–12". usccb.org. Retrieved 26 October 2016. ^ Ján Majerník; Joseph Ponessa; Laurie Watson Manhardt (2005). Come and See: The Synoptics: On the Gospels of Matthew, Mark, Luke. Emmaus Road Publishing. p. 108. ISBN 978-1-931018-31-9. ^ John Francis Wilson (23 July 2004). Caesarea Philippi: Banias, the Lost City of Pan. I.B.Tauris. p. 61. ISBN 978-0-85771-115-1. ^ "Who is St. Jude?, International Shrine of St. Jude, New Orleans, La". Judeshrine.com. Archived from the original on 18 November 2013. Retrieved 16 December 2013. ^ Murray, Lawrence (1 June 1998). The AMAZING SPREAD of CHRISTIANITY. ISBN 978-0-9722149-2-6. ^ a b "St. Jude Shrine Koothattukulam : St.Jude the Apostle". Archived from the original on 1 December 2012. ^ Prausnitz M. and Rahmani L.Y. (1967). Jewish Burial Caves of the Early Second Century CE at Kfar Baruch. In Me'eretz Kishon: The Book of the 'Emek. Kishon County Council, Tel Adashim. 309-312. ^ "Biography of St. Jude Thaddeus, St. Jude's Pilgrim Shrine, Travandrum, India". Stjudetvm.com. Retrieved 16 December 2013. ^ "Biography of St. Jude Thaddeus, St. Jude's Novena". stjudenovena.org. ^ Orsi, Robert A. (1996). Thank you, St. Jude women's devotion to the patron saint of hopeless causes. New Haven, Conn.: Yale University Press. pp. x. ISBN 9780300162691. ^ "Who is Saint Jude?". Carmelite.org. Archived from the original on 6 June 2015. Retrieved 2 May 2015.